Former FAU QB Rusty Smith was the first Owls player ever selected in the NFL Draft being chosen in the sixth round, 176 overall, by the Tennessee Titans in 2010, but he hasn’t played the best. In the 2011 NFL Draft, the Arizona Cardinals selected tight-end Rob Housler in the third round, 69th overall, and he was the team’s fourth leading receiver with 45 catches for 417 yards this season. 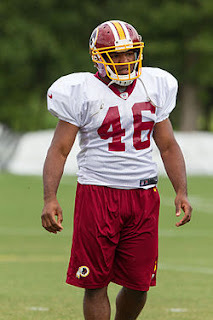 The best player ever drafted from FAU was running back Alfred Morris. There have only been three Owls picked in the NFL Draft. During the National Television games, the Owls are often referred to as "Tiny Florida Atlantic." But Morris, who turned 24 on December 12, had a monster rookie season playing in the same backfield as Heisman Trophy winner Robert Griffin III. He rushed for 1,613 yards, with a 4.8 average and 13 touchdowns. He was second in the league in rushing. Morris broke the Redskins single season rushing record previously held by former Miami Hurricane Clinton Portis, who had 1,516 yards. He broke Charley Taylor’s rookie season touchdown total of 10. In the Redskins final regular season game, a 28-13 win over the Dallas Cowboys that gave Washington it’s first NFC East title since 1999, all Morris did was amass 33 carries for 200 yards and three touchdowns. It was Washington’s first playoff appearance since 2007. Not bad for a guy that was a sixth round pick, 173 overall, that Washington selected in a trade with the Minnesota Vikings on July 27, 2011 for Donovan McNabb. Now McNabb is out of football and is doing radio in Philadelphia. Morris became the fourth player in NFL History to ever record over 1600 yards rushing in his rookie year. It’s safe to say that Redskins Owner Dan Snyder got a bargain when he signed Morris to a four-year $2.22 Million contract with a $154,000 signing bonus on May 6, 2012. But leave little doubt that with Snyder’s deep pockets of signing veteran free agents which failed to produce, Morris will have a new contract soon enough. What a difference a year makes. In 2011, Morris was the best player on a 1-11 FAU team. In 2012, he’s put FAU on the map playing a key role in the Redskins 10-6 season and as long as he stays healthy, the youngster out of Pensacola, Florida has a bright future ahead of him. Meanwhile, it’s time for the 5-10, 218 pounder to rest his body and get ready for 2013. The Redskins front office know they found a Hidden Gem to build their offense around while FAU can use Morris as a recruiting tool to build it’s young program.